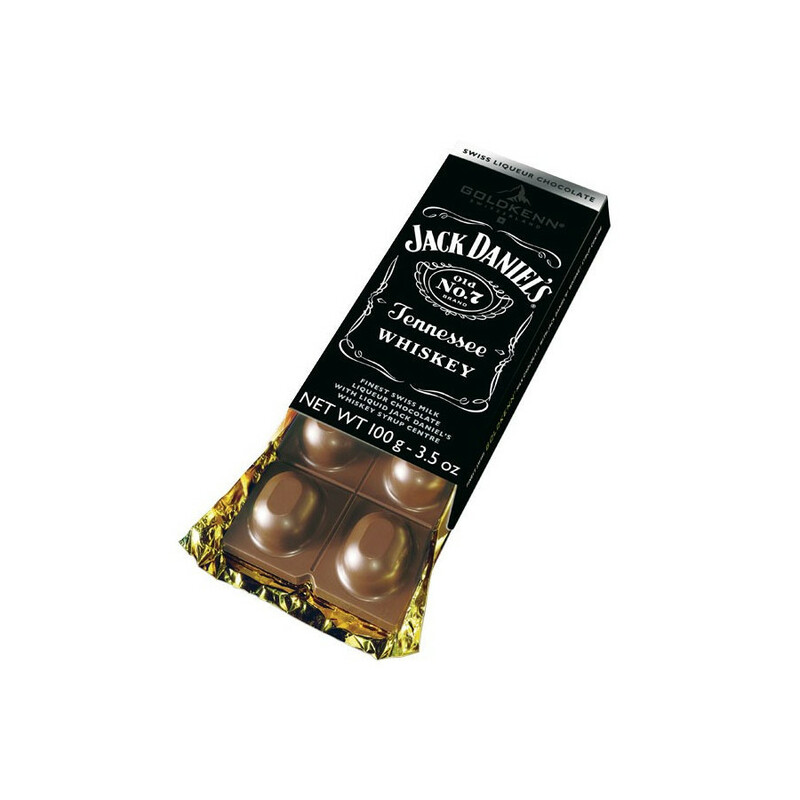 Swiss milk chocolate filled with Jack Daniel's Tennessee whiskey syrup. The famous Tennessee whiskey Jack Daniel's is associated here with Swiss chocolate for an original tasting. 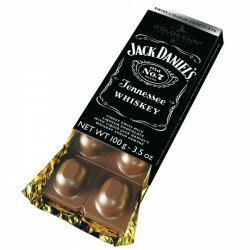 Swiss milk chocolate filled with Jack Daniel's syrup. Jack Daniel’s is one of the oldest licensed distilleries of the United States. It is today marked as a site of national historical importance. At the age of 7, Jack Daniel left his family and started working in a Tennessee distillery. At the age of 13, he purchased the company and became owner of the distillery. In 1886, he established the Jack Daniel’s Distillery, in Lynchburg, Tennessee, and obtained a license on the same year. The famous Tennessee whiskey is still produced today, according to the methods set up by Mr. Jack in 1866. In the “rickyard”, the distillery staff manufactures the charcoal used in the “mellowing” process of the whiskey. The distillate is then filtered drop by drop through a thick layer of maple wood charcoal. That process is the one giving Jack Daniel’s whiskey its unique taste. Whiskey is then aged for 5 years in new charred oak casks. Jack Daniel’s also crafts by-products with whiskey, such as barbecue sauces. Experts only swear by famous American BBQ sauces! The fine Jack Daniel’s barbecue sauces are made with genuine Jack Daniel’s Tennessee Whiskey, and are great to jazz up your meat, fish, poultry and vegetables.